“It is most unlikely that resources available for health care on the island are being used to maximum benefit for the population concerned, particularly in the border region… and the interests of institutions are being placed ahead of the health and safety of the population”. The study says that the same health strategies are being developed in both Northern Ireland and the Republic of Ireland, favouring the concentration of specialist services in a smaller number of larger hospitals, with local hospitals being limited to outpatient, day surgery and minor injury work. However there are important differences in the two strategies which make them incompatible. Northern Ireland places a greater premium on travel time from a consultant-run Accident and Emergency or obstetric unit, while the over-riding factor in the South is the size of the catchment population. 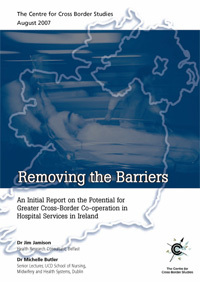 This would mean that if this Southern criterion for centralizing hospitals were to be applied across the border, there would be only four or five acute hospitals in Northern Ireland, rather than the nine or ten being planned, and large segments of the population would be more than an hour away from the nearest hospital. On the other hand, applying the Northern accessibility criterion in the South would mean that there would have to be more than the one acute hospital which is currently being planned for the former north-eastern region between Dublin and the border. Dr Jamison and Dr Butler say that major hospital rationalisation exercises in the two jurisdictions have proceeded independently of each other, as if each jurisdiction were ‘an island unto itself’ rather than joined along an increasingly permeable border. A clear example of this is the policy in the Republic, based on the Teamwork Report, which has effectively ignored the existence of Northern Ireland despite there having been a longstanding pattern of patient flows from North Louth into Newry for maternity services and renal dialysis. Further information from Centre for Cross Border Studies. Download a copy from BorderIreland. The negotiations for the UK’s withdrawal from the European Union What do they mean for relations within and between these islands?